I've been excited to see Trollhunter for quite a long time now. So excited in fact that when I saw that it was available to watch instantly, I did an actual giant fist pump into the air. 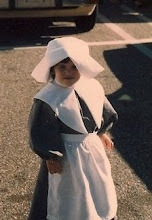 Before we go any further, I would like to take you on a magical trip to back when I was a wee one. 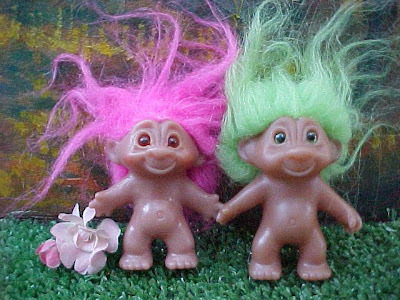 When I was a wee one, my sister and I had a pretty impressive Troll collection. Norfin Trolls that is. We kept our trolls in a Norfin Troll lunchbox and we had such wonderful additions as the policeman Troll, the ballerina Troll and the clown Troll. 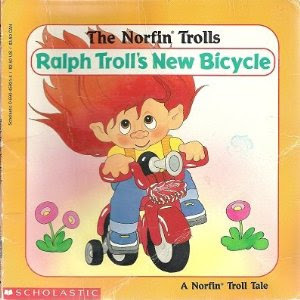 I also had a few Troll picture books. Yes, Trolls for some reason were the apple of my eye. Perhaps that is why I felt an almost immediate connection to the found footage mockumentary out of Norway dubbed Trollhunter. That and because I had heard it was fantastic. Plus I love the idea of incorporating country specific folk lore into horror movies and doing it well. Trollhunter, definitely does this well. 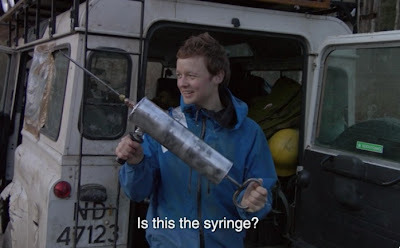 Three film students set out to make a news expose on the illegal poaching industry of Norway and end up trailing who they think is a powerful poacher by the name of Hans. Hans stays out all night, has a car with visible claw marks and is surprisingly mum about his nighttime activities. One night when the crew follows Hans into the woods they find out that the mysterious man is not quite a poacher after all. He's a Trollhunter. Mockumentaries are definitely becoming the new zombie fad of horror these days. Trollhunter however manages to stay interesting, original and just plan cool. Trolls are seldom spoken of these days and seeing these monstrous creations come to life in front of your eyes is truly a sight to see. The trolls are done entirely with CGI but it's a Jurassic Park level of CGI---one that makes you excited rather than skeptical. The CGI is well done and doesn't take away too much from the film. Rather than filling us with a sour note of disbelief, Trollhunter makes us feel like children again hoping that Trolls haven't migrated to the United States. There's also plenty to be insanely wowed by here. The first sighting of a Troll, the details surrounding the cover up operation and the TSS forms that must be filled out after every Troll death. the different species of Trolls, the giant Troll syringe....I could go on for hours. One of the greatest and most stress filled moments however is when our film crew and Hans take a trip into a mine that has been an active house for a clan of Trolls. Despite the Trolls not being inside at the moment, we get a giant sense of worry as soon as our characters take their first steps inside. The monstrous cave is filled with splotches of blood and bones, Troll stenches galore and just bad feelings all around. When the group starts hearing troll sounds off in the distance our bad feelings are thrown into overdrive. They almost make it out as we see one giant mountain troll, followed by another, another and another. Deciding the only thing to do is flee back into the cave, the group hides out in a small crevice as the troll clan sits in front of them unaware of the four humans invading their home. It's a moment filled with just the right amount of suspense and dread and it ends in one of the greatest ways ever. 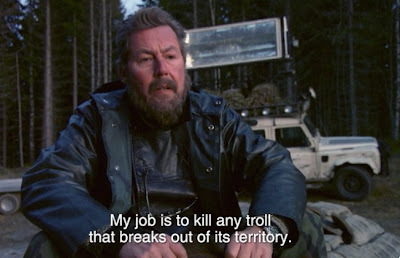 To top all these great moments off, we find that there is no hero better than the Trollhunter himself--Hans. Hans is a quiet badass. 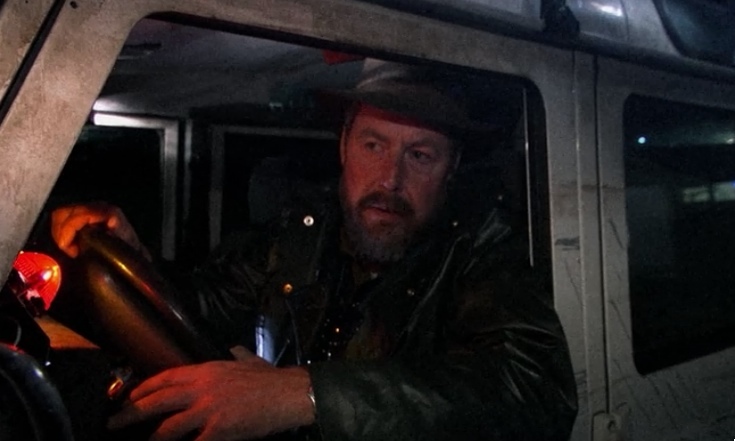 The kind of badass that wears bulky sweaters and indestructible metal suits to claim blood samples from trolls, and hangs troll tails from his camper. Hans' character is so great and likable that he becomes an instant candidate for having his own poster in my bedroom. 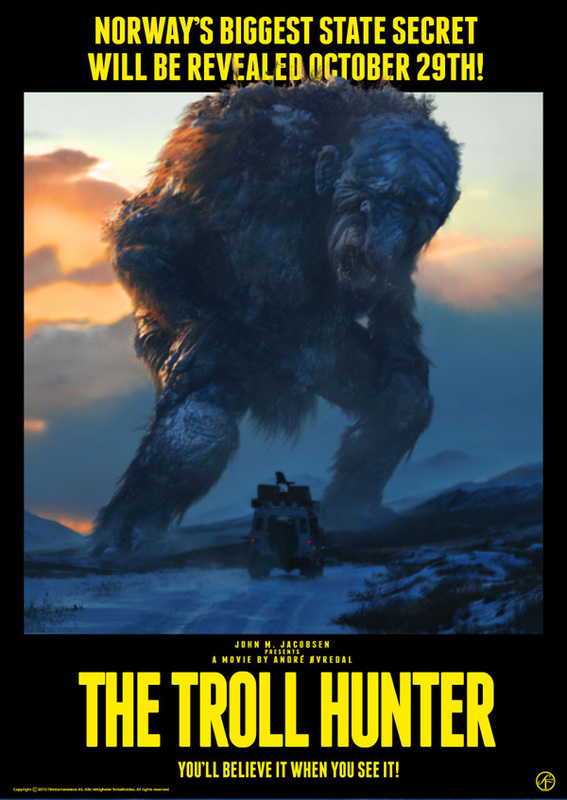 In short, Trollhunter is a movie you will not want to miss. It's funny, scary at times, suspenseful, entertaining and just plain awesome. Sure, the Trolls may not be Norfin style with jewels in their belly buttons, but they are big and scary. Plus they smell and sometimes have three heads. Why would you not want to see this again? Good call. Just saw this last week and dug it much. And Hans is quite BA. I don't know if I'd say he's Plissken BA, but he's BA enough. I caught Trollhunter this week, and I must say that, of all the recent found-footage films, this is one of the best I've seen. It was clever, well-made and fun. While the found-footage trend has been overplayed, this film is a breath of fresh air. 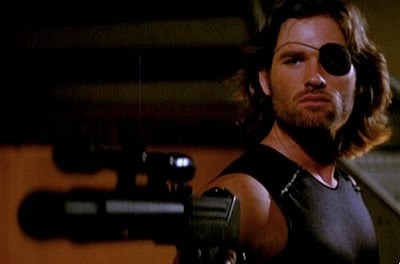 NO ONE is Snake Plissken BA level. NO ONE. I loved the part where Hans lured a troll with three goats on a bridge. A lesser movie would have emphasized that they were billy goats. Brilliant, hilarious movie - and yeah I'd put Hans up there with Snake, who never had to survive being chewed on by an enormous troll with only a large tin can for protection. I like the fact that unlike so many of these found footage films we actually get to see the trolls. Paranormal Activity we don't see the demon. Blair Witch we see no witch, etc. But in Trollhunter lo and behold we see trolls...lots of 'em!! Love the cene in the cave when the troll lets out a long troll fart! Tension filled and funny all in one. Reading your blog entries kept me entertained throughout the entire summer. I really enjoy the personality and voice you use in your writing. Also, your taste in horror films is exquisite and seems quite similar to mine. 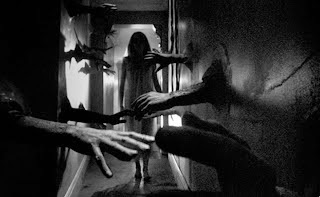 I personally HEART Blood and Black Lace, Let's Scare Jessica to Death, Dead Ringers, The Innocents, Hausu, Sisters, Repulsion, The Sentinel, Santa Sangre, The Devils, Xtro, and Tourist Trap to name a few. I guess thought I would finally comment here and tell you that your reviews and what you've got going on here is pretty spiffy. I have actually pushed a several movies further up my to-see list, after reading what you had to say. Anyways yeah, I was scrolling from the bottom up and I saw the picture for Trollhunter before the title, and had a brief moment of "Oh lord, what in all creation is that thing?" I remember Nordic trolls, but this one looks more like the one that lived under the bridge and messed with the three billy goats gruff. I never truly thought about it, but I suppose I do appreciate well-done mockumentaries (keyword being well-done) and the folk tales of foreign countries. Keep up the watching and the sharing. Wow, it's been forever since I've commented but I gotta say I dug this movie, too. It had quite a few deadpan-funny moments. For some reason, I found the notion of trolls gnawing on tires hilarious. 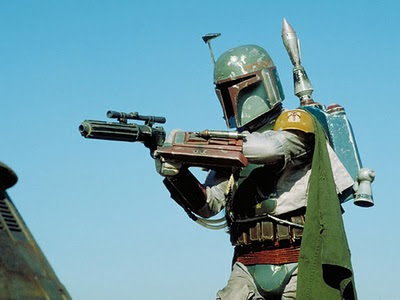 And yes, Hans does belong in the upper echelon of badassery. DOD! 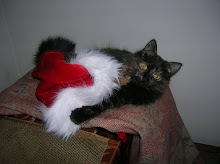 I miss you ! Andre! Miss you, too! We must catch up soon. 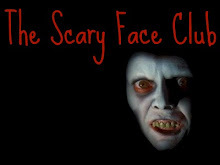 Found your blog recently when looking for scary faces. Nice hero list. 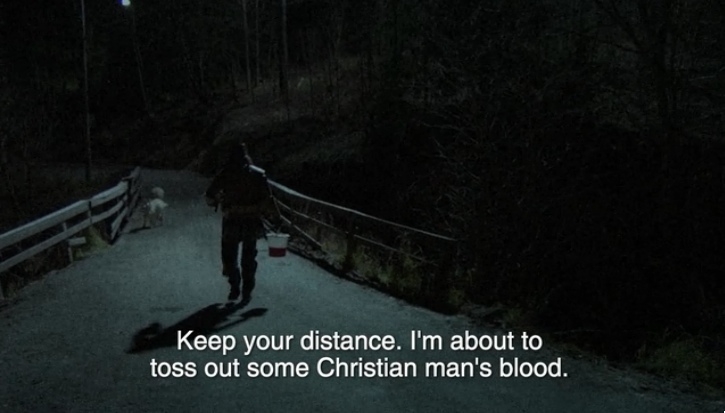 I think another interesting aspect of Trollhunter is the sympathy for the trolls it manages to generate. They aren't really evil, so much as they are agnostic omnivores. And Hans, as good as he is at it, doesn't seem to relish killing them. Overall it was a great little film. I look forward to viewing some of the others on your list.